The National Treatment Agency has an interesting paper out about club drugs which is the increasingly generic term for a range of substances that are heavily associated clubbing culture. The drugs include ecstasy, GBH and GBL, Ketamine, Methamphetamine, and Mephedrone. The data that the agency presents shows that the numbers of young people being treated for these substances has remained relatively stable over the last few years, but digging deeper it is apparent that there have been quite big changes in the individual drugs that have led to the need for treatment. Talking with Dr Own Boden Jones who runs the Westminster Club Drug Clinic, and who is quoted in the NTA paper, he’s told me that the experience they’ve had is that club drug users don’t consider themselves to be the sort of drug user that could or should access traditional drug treatment clinics. This, if true, may mean that the numbers of people in trouble with these drugs are higher than the NTA figures suggest, and that it takes them longer to access treatment. From our point of view the paper Claire wrote for the Drug Education Forum on Legal Highs earlier this year sets out our best understanding of how to tackle these drugs in terms of education and prevention. See here for a summary of Mentor’s views on Legal Highs. 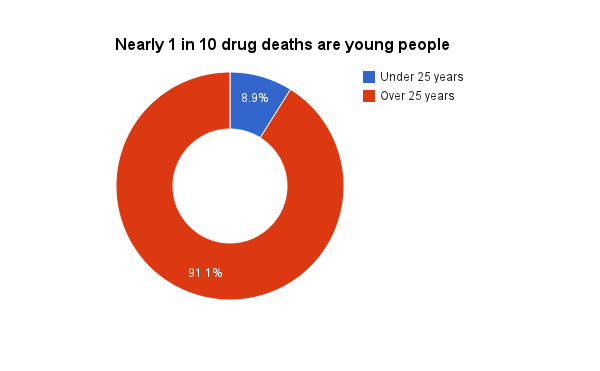 The annual report on drug deaths in the UK has been published and shows that in 2010 one in ten deaths were under 24 years of age. As you may have seen in the media reporting of the issue there is some good news in that there has been a fall of 13% in the number of drug related deaths since 2009. Looking at the drugs that are associated with the deaths in that year it is clear that heroin remains the most likely drug to kill with over 130 fatalities in the last year. However, as has been reported in the media, the growth in the number of fatalities associated with novel psychoactive substances (‘legal’ highs) is going to be causing alarm. The big rise in these deaths seems to have been as a result of mephedrone, where deaths rose from 5 in 2009 to 29 the following year. It is worth remembering that despite broadly positive trends drug deaths remain high when compared to our European neighbours. Want to know about Legal Highs? This lecture from Russell Newcombe is pretty comprehensive. Rough days, a photo by bayat on Flickr. A new piece of research carried out in South London suggests that legal highs – other than mephedrone – may be less popular than the media myth may have us believe. 206 (66%) had previously used a ‘legal high’. Mephedrone had the highest prevalence of last month use (53%) and use on the night of the survey (41%). There was limited use on the fieldwork night of the non-mephedrone ‘legal highs’: including the ketamine-substitute methoxetamine or ‘mexxy’ (2%), the cannabis-substitute Spice/K2 (0.6%) and the pipradrols (0.6%).